We have gifts from Trixie and Milo including portable collapsible shot glasses, pint glass drinking games, and metal flasks with interesting designs. Belham Herbals is a small unique business we work with. We currently have hand crafted soap scrub made with fair trade coffee and a variety of bath "truffles" which are really just extra moisturizing bath bombs. Fox and Clover provides us with a variety of water bottles, thermoses and coffee mugs with sarcastic, popculture ridden adorable sayings and illustrations on them. You can go with the "Zero Fox Given" thermos or the "Damn It Feels Good To Be A Gangster Mug" or anything in between. 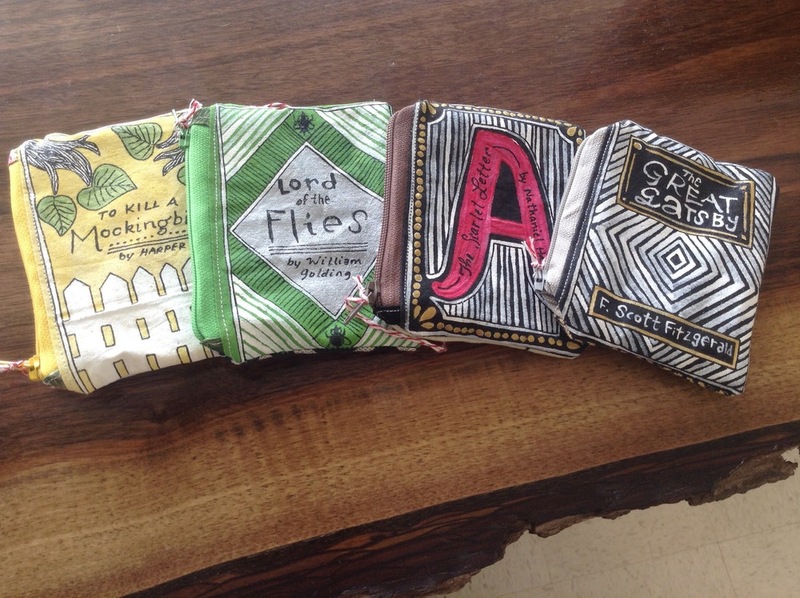 Sweet Sequels makes these adorable hand painted coin purses. (They're so cute, I bought one myself) Painted on the front are the covers to four very distinguished books: To Kill A Mockingbird, Lord of the Flies, The Scarlet Letter, and The Great Gatsby. They're the perfect size for cash, coins, or cards. Werther & Gray are expert candle-makers. We have a variety of scents including Earl Grey, Antique Books and Edgar Allen Poe... a mixture of rosewood and black currant. You're sure to love these unique and varied scents.